The new buses, purchased and funded by Dutchess County, will be part of a fleet of four OFA buses and five vans. 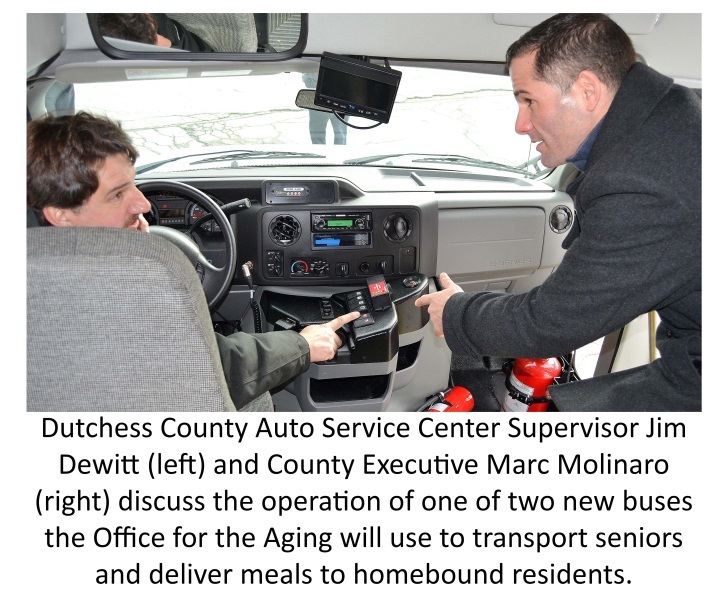 They will go into service in mid-March and replace two vehicles that provided approximately 6,500 trips for seniors last year and delivered approximately 7,200 home-delivered meals to isolated, homebound county residents. In 2015, the Office for the Aging delivered a total of 114,262 home-delivered meals to 600 homebound residents and 39,728 congregate meals at Senior Friendship Centers and senior picnics. The Office for the Aging’s Senior Friendship Centers provide an opportunity for seniors to share in a hot meal, partake in social activities and receive nutrition screening, assessment, education and counseling. Centers are located in Beacon, East Fishkill, Millerton, Pawling, the City of Poughkeepsie, Rhinebeck, South Amenia, and the Tri-Town Center which serves the towns of Poughkeepsie, Pleasant Valley and LaGrange. Most centers are open Monday through Thursday. For more information about the center nearest you, call the Dutchess County Office for the Aging at (845) 486-2555 or click here.